In all the months I’ve been writing about recipes inspired by musicals (check here if you’ve missed any), it’s hard to believe I haven’t written about The Music Man. It features one of the most spirited songs ever written for a musical – “Seventy-Six Trombones” – not to mention one of the all-time classics, “Trouble (in River City)”. Also, one of the most persistent ear worms. Don’t listen to “Gary, Indiana” unless you’re prepared to hum it for the rest of your life. As much as I adored the movie (featuring the wonderful Shirley Jones as Marian and little Ron Howard as Winthrop), I enjoyed the live version even more. We took my mom to Stratford, Ontario to watch it about five years ago. The energy was contagious, the singing was dynamic, and I left the theatre remembering once again why I love musicals so much. The plot is simple. Harold Hill has come to River City, Iowa intending to sell musical instruments to the residents, and swindle them out of their money. But his plan hits a snag when he falls in love with Marian, the beautiful but aloof librarian, who is the only one in town who sees through his ruse. (And for whom is written the only love song I know that references carrion.) The show ends with an ice cream social, where Hill is exposed as a fraud, but is ultimately forgiven when it turns out he’s taught the band to play after all. Don’t you wish we lived in a time where every small town still had an ice cream social? It sounds like a great way to meet and socialize with your neighbours. Put together a barbershop quartet to entertain them, like they did in River City, and you’d have the most popular event of the summer. I’ve made this ice cream dish a few times for my family, and served it most recently at Easter. It was unanimous – everyone loved this amazing combination of lemon and ginger. And if you’re concerned about the calories, you could always replace the vanilla ice cream with vanilla frozen yogurt – and host the first-ever frozen yogurt social! Preheat oven to 350 degrees. Line an 8” x 8” pan with parchment paper. To prepare the crust, melt the butter then mix together with the gingersnap crumbs, sugar and ginger. Press into prepared pan and bake for 15 minutes. Remove from oven and let cool completely. To make the filling, make sure that the vanilla ice cream is soft but not melted. You should be able to stir it, but it shouldn’t be soupy. Whip the heavy cream to firm peaks, then stir together the soft ice cream, the thawed lemonade concentrate, and the whipped cream. Pour the lemon-vanilla ice cream mixture onto the cooled base. Refreeze the dessert for at least another 2 hours, until the filling is frozen solid. Remove dessert from the freezer ten minutes before serving, to give it time to soften slightly. Garnish with lemon slices, lemon zest, ginger cookies and whipped cream, as desired. Ooh, my husband loves lemon inspired desserts. Thanks for sharing this recipe. Can you believe I've never seen the "Music Man?" I didn't even know what it was about! It sounds wonderful – maybe my next Netflix rental! 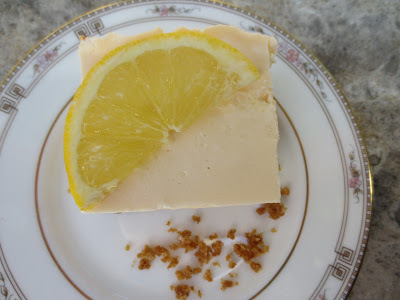 Yes to ice cream socials, and to these lemon-ginger bars! I haven't seen the Music Man for years! Great musical – one of the best. And this ice cream is one of the best recipes I've seen too! Lemon and ginger? I'm in heaven – I love those flavors! Glad to see your musically inspired recipes are back – I love this feature. This dessert sounds amazing! Love the combination of ginger and lemon. Life seemed so much simpler back then. An ice cream social would be a fabulous way to spend a sunday afternoon! Have a wonderful weekend, Beth! Growing up in Iowa, I always had a special place in my heart for The Music Man! And we've enjoyed a wonderful spring day…warm enough to have an ice cream creation for dessert. Yours looks marvelous! What a tasty sounding dessert! Oh Beth – this is all sunshine and light – like the musical. I've seen it many times (occupational hazard) but my favorite was in an outdoor park surrounded by homes from the turn of the last century – complete with gazebo – perfect. The ginger and lemon dessert would have capped the evening beautifully. I adored the Music Man! When I was a kid I liked the song, Shipoopi:) My parents took us to a lot of musicals…such great memories. Next time I will eat THIS pie when I watch the movie~YUM! Hi, blog hopping and stumbled upon your wonderful blog. I remember this recipe! It's been a long time since I made it. Thanks for reminding me, Beth. Music Man was/is still a delight. how very refreshing! even though i'll probably always love cinnamon best, ginger is gaining ground on my list of favorite spices! Oh man an ice cream social would be AWESOME. Guess I'll just have to "settle" for these bars. 😛 LOVE lemon and ginger together! Music, poetry, folk lore, literature…In the end connects back to food. Love it! Love this dessert. I don't need a ice cream social to eat ice cream, but it does sound like fun. This ice cream desert looks refreshing and delicious! The lemon with the ginger snap crust is mouth watering! My family will love this one! I do not know this movie although it sounds very interesting! The ice cream desert though just stole my heart! Gingersnap crust with ice cream filling…what an intriguing combo! That sounds delicious! I read Sugar Hero, but must have missed that recipe. What a fun musical! I'm on a citrus kick so this yummy ice cream treat looks yummy. It did snow today but Ice cream weather has got to be just around the corner–right! wow—what a cool blend of ingredients. I have made "cheater ginger" ice cream-swirling fresh grated ginger into softened vanilla ice cream, but I would never have thought to use the frozen lemonade in that way.love it! The Music Man is one of my favorite musicals. We used to have ice cream socials all the time when I was in college and they were so much fun. Your dessert sounds and looks really delicious. Beth, what a very pretty looking ice cream dessert. 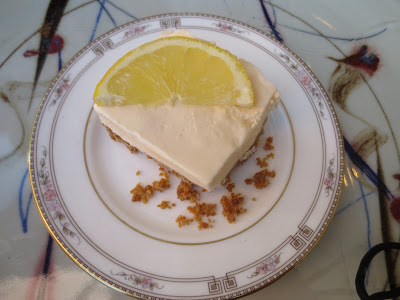 The taste combination of lemon and ginger together with that gingersnap crust sounds delectable – what a great recipe and lovely post about that wonderful Broadway musical "The Music Man"! I haven't seen the movie or the musical. Obviously this must change! I would love to make a batch of this ice cream dessert to enjoy while watching. Thank you for sharing! Oh, my! Looks yum! Great combination! Hi Jemi, heavy cream is actually whipping cream. I've added the clarification to the recipe. Thanks for pointing that out! Whipped cream and ice cream in the same dish is a sure winner in my book. I can't remember the last time I saw that movie, probably time to find it and see it again. Hope you and the family had a nice Easter.